Well my Breville 800 ES Pro has started to spit water out of the group head so I’m of the opinion that it is about ready to be replaced. I was suspicious that it was close to failing for the last two weeks. I’ve had it for about 6 years, making 10 to 12 coffees a week. I have coffee every morning before I go to work but because of my time constraints I usually have a macchiato. When time permits I have cappuccinos. This was my second machine as I bought a Sunbeam Café Espresso about 15 years ago that lasted about 3 years before it died. In between machines I lived with Moka Pots. I usually like to leave my machine to heat up for at least 10 minutes before I make my coffee, but if time is short I will flush water through first to get everything up to temperature. I use a Breville BCG820BSS grinder that I’ve had for about 18 months. I generally use supermarket beans due mostly to convenience. I have found that the locally roasted beans are only good for about 3 days so I get better consistency out of the supermarket beans. And of course the price is also attractive. For a long time, I coveted the Rancilio Silvia and trawled EBay for deals without ever pulling the trigger. My recent research has reviled that the Silvia is probably not the best machine for me due to the need to manage the boiler temperature, and there are better machines for steaming milk. My wife will be using the machine and she is not as engaged or experienced in the coffee making process so my replacement machine needs to be fairly easy to use. She is essentially a novice. I have considered the Breville Double boiler but I can’t seem to get one without the smart grinder, and the part where it needs to be sent to a service centre to be de-scaled has knocked it off the list. I looked into the Nuova Simonelli Oscar II and the Bezzera BZ10. I’d like to understand a couple of things about the HX machines, with respect to the EM7000. I have also considered the Lelit PL60 variants. What is the heat up time like? Are they better to be left on? In our house the machine is likely to only be used once or twice a day so we would be inclined to turn it on only when needed. Can I de-scale these units at home? What other maintenance is required on these types of units, specifically what are the typical service intervals? Noise is a big concern; the old machine makes quite a racket when I turn it on so I have to wait until everyone is awake before I can turn it on. I understand the EM7000 is relatively quiet. I have also seen a La Nuova Era Cuadra and an Isomac Espresso Tea second hand in relative proximity to me, though I haven’t enquired about their age and level of use. The timing of my old machine failing is quite bad as we are about to embark on the process of building a new house so our budget is very constrained. On the flip side we can design our new machine into our new kitchen, it will actually live in the pantry. I may consider plumbing it in with an in-line water filter. I am confident that all the machines I have considered will produce coffee that will meet my quality standards, my concerns are around noise, ease of use and longevity. I know the Sunbeam machine is unlikely to still be going in 10 years’ time whereas the HX or a BD machine will still be going strong. Sorry about the brain spew but I’ve been mulling over this for quite some time but I haven’t necessarily found the answers I am looking for. I’m looking forward to some enlightened responses! I didn't know what an 800ES Pro was so I googled it and found it on Myer Direct for $225 with two years replacement warranty and five years on the pump. So, what is so terrible about an 800ES that an experienced user won't buy another when they are so cheap??? The old machine has a number of short cummings. For one it's not very powerful, uses a narrow portafilter and the purge water doesn't necessarily drain to the drip tray so every time I empty the drip tray I have to clean up the excess mess. The steam is also relatively wet. If you like the Breville and its served you well for 6 years what's wrong with one of the more expensive Breville products? I don't like the Breville that much. It performs adequately for what it is, but I always knew I wanted a better machine. Completely understandable! The disease is progressing nicely..
Javaphile, matth3wh, RavenMad and 2 others like this. I was in a similar position to you, I hate. hate noisy coffee makers. I ended up with a Ponte Vecchio Lusso lever machine, had it for a long time now. Always used basic filtered fridge water, never had a scale issue. The only issue with the machine is the seals don't last very long at the start, and as it wears in they last for ages. I haven't changed the piston seals for years now. You would probably be happy with a 7000 (I have a 7000, 2 * 6910s and a 2 group La Pav commercial machine). Out of the ones mentioned it strikes a good balance between being quiet (my others would wake the dead), fast warm up time (circa 75 to 90 seconds, one quick pre flush to warm up the p/f and it is ready to rock) and ease of use (for your wife). Just don't pull my trick and extend the standby settings - it will overheat & blow a milk temp thermostat every couple of years (about a $6 part if you do it yourself). You did not mention your grinder (or it is very late here and I missed it). Either a Breville Smartgrinder or the SB 480 / 500 are about the lowest that will mostly be up to the job of running into it. I say mostly because I have seen a few shockers of both of them "out of the box". Needless to say, a warranty replacement is a done deal in the early days... Neither are particularly quiet. The Breville is about $250 and is more automated, the SB is $50 cheaper and more "hands on manual". Awaiting specials may reduce that considerably. The other point worth noting "post grinder" is that converting your p/f to naked and getting some VST baskets will make a huge difference to both the "in the cup flavour" and the amount of coffee you use (15 to 30% less for the same flavour whack). Good luck with your build (I am doing the same). Enjoy your cuppa - all else is secondary in terms of coffee. Well I finally bit the bullet and ponied up for the Sunbeam EM7000. I've had it a little over a week now and I'm pretty happy with the machine so far. Compared to my old Breville it is better in every way, except the location of the steam wand. I love being able to texture the milk and extract the espresso at the same time. I can make two coffees quicker now than it used to take me to make one with the old machine. It's Soo much quieter too. Patmac, I have found that the EM7000 is more sensitive to changes in courseness than grind amount. 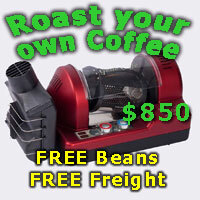 Using fresh beans from my local roasters I have my grinder set on 9.8 seconds and the grind is 12 for a single shot. I make milk based drinks so my settings may not work for you if you want to drink espresso. I guess the main thing about living with the 7000 is to be prepared to tinker a little, maintain a lot. Not in the manual and should be: Using a No2 philipshead and removing the showerscreens "when needing it" (will depend upon your roasts and your usage) is probably the most critical item for long term consistent coffee. Also pre flushing before the first run of shots (gets the whole mechanism up to temp) and giving a quick postflush (i.e. the standard preinfusion plus about one second) between each shot plus a wipedown of the grouphead and associated gaps (the old style traditional sponges are a perfect fit between the showerscreen and the collar) will help to keep the quality of the shots up amd keep the machine cleaner. FYI, I do the same on almost any espresso machine, and have done so since 1970 so please all those up market posters - don't bother to "educate me" on that one. Taste rules. Glad you like it. I still reckon it is the easiest machine to live with - the lack of noise and the 90 second warmup is most compelling. Option 1) Start with the grinder. Most CS readers know I use the Swiss made Mahlkonig Varios (currently 2 * gen2's and 1 * gen3), however any top quality grinder with an even particle spread will improve the taste of your shot dramatically. Makes a huge difference in every way - and even cuts down on the amount of coffee you need to get the same flavour whack. As grinders are way, way more important than the espresso machine please do not skimp here. Option 2) If you are fairly happy with the grinder, the "terrible trio" works wonders and has a lot of positive synergy. I view them as a package deal. Find / buy / convert to a naked p/f - get some VST baskets (and no, none of the "so say equivalents" I have used have been close to the VST) - consider a flat based quality fitted tamper. I would suggest doing all three together as it avoids the old "two steps forward, one backward" issue by doing that in stage. It also minimises the learning / unlearning grief stricken process I went through. 1) Naked p/f. The SB7000 has a really thick stainless steel p/f. Without the correct gear it is a pain to convert in a home workshop. Hopefully less than $150 (buying a cafelat p/f was about $120 last time I looked). Having a friend with a "industrial lathe or holesaw" and stainless steel cutting fluid is cheaper, however finding an old 6910 brass p/f (two for $20 here recently) and using any holesaw is cheaper again and likely to give a better finish than using stainless. 2) VST baskets - around $40 each and worth every cent of it. Be aware that they flow about 50% more than standard baskets, and extract close to 50% more flavour. Just buy the sizes you need if you are on a tight budget, or buy the whole set for around $200 if possible (allows a lot of tinkering). Speak to 5 CSrs and expect to get 20+ size recommendations! I have a few sets (and two different locales) however I mainly use the 7g (daily cuppa - but my normal roasts are full flavoured), followed by the 15g (weaker roasts) and 22g (for cooking / breadmaking and doing "bulk bottled lightning" when needed). I rarely use the 18g or 20g. Others differ markedly, probably based on their preferred roast and personal flavour hit. 3) Flat based tampers - from about $40 to several hundred. FWIW, I use a few 316 steel ones mostly Pullman Barista bases and all of the ones I currently use are Pullman wood handles - I like the fit and balance, however that is a personal fitment issue, not a general recommendation. The 316 is good as it does not pick up static unlike virtually any other material - but it is costly. Oh, and I do not use / recommend tamping rings (on the tamper - to let you see how level it is) as they attract coffee grounds. My 316 bases stay clean for eons. Enjoy your cuppa - the rest is immaterial. One point - VST / naked combo will "totally redefine" your correct gauge readings (very different flow rate, finer grind partially compensates but it throws the gauge reading out). My preferred shots start slow, often the gauge maxes out at first and then slowly comes down to the boundary between red and orange. YMMV, however I strongly recommend you tinker to get the best taste and then note what the gauge did... not the other way around! As long as your are enjoying your cuppa all is well. Same here re the gauge, using decent espresso baskets on the 7000, and a naked P/F. On 6910, VST, and naked p/f. Usually 15gm first thing in the morning, and 7gm after that. Slowly getting to see one drip stream down the middle, always cut the shot as it starts to go too blond/watery. Haven't yet sprung to a Vario, still using an EM 480 on both machines, and a 440 in my campervan with an EM5600, naked P/F, but hard to get the best shot out of one of these. Hi GazzPops, what did you pay for your EM7000? I'm in the market for a new machine and I think I have the exact same requirements as you!? Do you find it quick to heat up and not too noisy? I picked my machine up from The Good Guys for $599 on special. Heat up time is good and the noise is excellent. The noisiest part of using the machine is frothing the milk! I have had problems with the puck sticking to the shower screen when I over tamp using the single basket. When it doesn't stick it doesn't come out all that cleanly either so I'm thinking about getting a VST basket. I'm still really happy with the machine and loving my morning coffee. Thanks GazzaPops, I'll go to my local good guys and ask for that price. With regards to cleaning and maintenance, what is the expected regime? Descale, backwash etc? I've only had my machine for a month so I haven't done a descale or a backflush yet. I give it a flush after every shot, I'm probably due to give the shower screen a clean. I just posted this an another thread - hope it helps. Length of service: depends how well you maintain them. My 2008* and 2007 SB 6910s are still going strong with no reliability issues after initial havoc. Fail to maintain it properly and you can kill any machine (yep, even $20+K commercial ones) in three months. Feed it poor WA tap water directly and it will die very quickly indeed. I expect the Brevilles are similar as the ones my friends have are well looked after and many years old. First essential step (if you haven't already worked it out) is to feed it properly filtered water. IMO those in tank filters do terrible things to the flavour of the cuppa so I do not recommend them at all - I removed mine before I finished unpacking the machine out of the box, and I have a firm "throw out on sight" policy for any friend's machine I work on. FWIW, I use rainwater filtered both into the tank and out of the tank - that may be extreme, however after 18 months there is no residual in the tank - although where I live has very clean "virtually salt free" air and therefore very good quality rainwater to begin with. At an educated guess I reckon the 6910 will give well over 10 years and the Silvia ditto given a fair amount of TLC without going over the top. The 7000 would be about a year less - it is just not quite as solid. Second essential step - no2 phillips head screwdriver and remove the showerscreens (yep, like some seriously upmarket machines the 6910 / 7000 has twin showerscreens, and preinfusion for that matter). I buy my beans in 250g lots (light to medium roast SO's I like variety) and do the showerscreens every time I change a batch. I could probably get away with 750g on most batches. Oily dark roasts - every 150g or even more often. Third essential step - a quick preflush starts to dissolve any leftover gunk / warms the machine up properly. I do the standard preinfusion plus a couple of seconds. Ditto a post "current series of shots" flush - after I clean the p/f, I place it back in the machine and do another standard preinfusion plus a couple of seconds. I then wipe down the group area. Fourth step - the 7000 has both a clean and a descale. I don't do the cleaning cycle at home (remember my rainwater is probably cleaner than most "store bought" distilled waters), however friends with worse water do a cleaning cycle every week or so (depends upon their usage). A descale every few months is a good idea "whether it needs it or not". Basically, if either the steam or the shot "go off the boil" then do a descale before faffing around trying to troubleshoot it. Fifth step - Note: Especially when learning, it is fairly common to pollute the steam wand's internals with dried on milk. I use a "over half full of water" large milk jug and let the wand heat it up, turn the steam off and leave the jug in place for a couple of minutes (hint: use the drip tray as a stand). That will slurp up some hot water into the wand. Then remove the jug and turn the steam on full - after a splutter of water into the drip tray there should be a plentiful supply of even steam coming out. If not descale it. After your technique improves both the group and the wand will need a descale at roughly the same time. *my 2008 was supposed to be new in 2010, it wasn't and an initial botched repair followed by a proper repair in mid 2011 are its only initial issues. The 2007 6910 received an A to Z clean when I inherited it about 5 years ago. Since then, nothing for either 6910 - not even a seal. I had my Silvia for 9 trouble free years - the next owner took three years to kill it (like most dead Silvias, run it out of water once and pay around $500 for a new boiler / heater). If they had maintained my old Miss S correctly it would probably still be going.